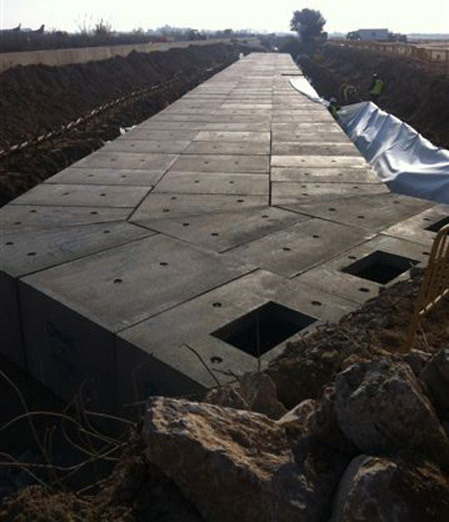 Precast frames concrete are rectangular elements of reinforced concrete that are so versatile they can be used for underpasses, transverse drainage, service galleries, big pipe-work, channelling, drainage, sewers and large-scale inspection chambers. The range is very diverse, as there are single-part closed frames and jointed frames. Our prefabricated concrete frames can cover various dimensions depending on the interior light required in the project, the height of the soils and the traffic they must bear. For each frame, depending on the conditions of installation and service, a calculation is performed for its reinforcement. This calculation is done based on the current Structural Concrete Instruction (EHE) and the specific instructions of each of the applications: roads, railway lines, airports, sewers, etc. From 1 May 2008, these products must have the CE marking under system 2, whereby the manufacturer must be certified by an external company that verifies and guarantees compliance with the requirements indicated in the reference standard UNE EN 14,844.